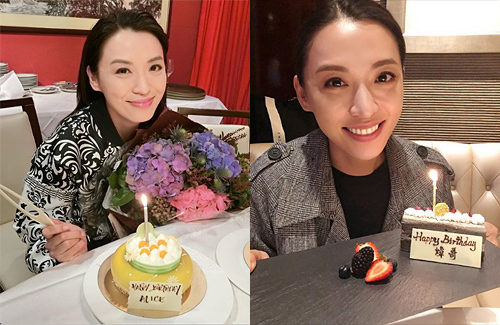 Known to have a wide circle of friends in the industry, Alice Chan (陳煒) attended endless birthday dinners with friends and co-workers, including Natalie Tong (唐詩詠), Kenneth Ma (馬國明), Jacqueline Wong (黃心穎), Anthony Ho (何遠東), and Ken Law (羅浩銘). Not only did her friends surprise Alice with a cake for her 45th birthday, but when Alice was getting ready to blow out the candles, the actress received a kiss from a younger man. Although it appeared as if she picked up a new boyfriend, it was really in fact her co-worker, Kelvin Lee (李興華), from 2015’s Lord of Shanghai <梟雄> together. It turns out that it was also Kelvin’s birthday and the two were celebrating it together. Single since her divorce in 2012, Alice concentrated on work after refusing to take alimony from her ex-husband. In the six years that Alice has been with TVB, the actress managed to work her way up to the top. She gained a lot of friends in the industry and became a favorite among producers and directors. Known to be rather frugal, Alice only rents a cozy home in the Yau Tong area despite having filmed six dramas this year. On her days off, Alice does not take exotic vacations but spends her free time exploring the city. Recently, she was seen taking a day trip around the Central district with her older sister. Dressed in a simple top and jeans, and with minimal makeup on, Alice and her sister were photographed having coffee and sandwiches at a local shop before making their way over to the waterfronts. Maintaining a close relationship with her sister despite their 10-year age gap, the two were chatting happily during their walk and even took a ferris wheel ride before their day came to an end. Alice still looks amazing at the age 45 and she does look so much alike Anita Mui Yi Fong? Happy Birthday Alice! Yes and she did play Anita Mui in a movie or series about Anita’s life. She really looked like Anita.